Three abraded body sherds from ceramic vessels of probable prehistoric date. The fabrics all have a light grey core with frequent crushed flint temper up to c. 4.5 mm in size and some small crushed shell-like inclusions. 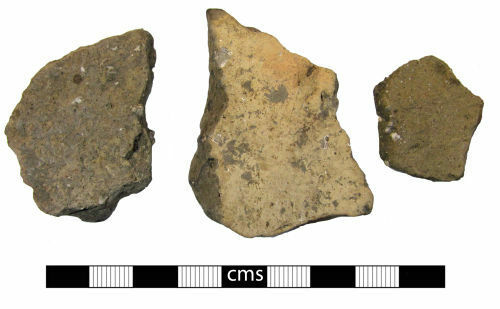 Externally the smaller sherds have exterior walls that are brown with a slight pinkish hue externally. The larger sherd is darker internally with a light buff or orangey outer wall. Several pieces of prehistoric pottery spanning the late Bronze Age to late Iron Age, of which these are two, were recovered from a small area around Brightwell Barrow in the 1920s. Probably early Iron Age in date (c. 800 -401 BC).